Throughout the negotiations over the future of “Dreamers,” President Trump’s shifting and often contradictory positions have flummoxed leaders in both parties. How the president came down on the terms of any DACA deal seemed to vary by the hour. But no longer: President Trump has said twice now he is prepared to offer a path to citizenship for as many as 1.8 million undocumented immigrants, including the roughly 690,000 currently enrolled in DACA. But while Mr. Trump’s willingness to entertain a path to citizenship represents a welcome departure, the rest of the proposed deal’s terms are deeply troubling. In exchange for citizenship for Dreamers, President Trump demands not only $25 billion for a border wall but also a dramatic restructuring of the legal immigration system. Not only would there be an end to the diversity visa lottery, but the immigration package would put an end to what the Trump administration has branded “chain migration.” What were previously understood as “family reunification visas” would be restricted to spouses and minor children. No parents, no siblings, not even adult children under the proposal can be included. According to a study by the Cato Institute, the Trump plan could reduce the number of legal immigrants to the United States this year by almost half. While Mr. Trump’s willingness to entertain a path to citizenship represents a welcome departure, the rest of the proposed deal’s terms are deeply troubling. Mr. Trump’s proposal represents an almost complete reversal from previous Republican immigration priorities. Republican resistance to a path to citizenship for undocumented residents had been understood to at least nominally be based on opposition to rewarding law-breaking with immigrant amnesty. It was to counter this position that the Dreamers’ predicament—having been brought to the United States as children—was emphasized. But now Mr. Trump, with significant Republican support, is proposing cutting the line in half. This policy is popular enough with the ascendant nativist wing of the G.O.P. that they have offered in return for the cutback the long-derided “amnesty.” It is a whiplash-inducing shift in policy goals. By adding legal immigration to his targets, Mr. Trump has revealed a desire to resist a long-term demographic trend toward a greater diversity. By holding the Dreamers hostage, Mr. Trump believes he can secure his restrictionist policy goals. For Democrats the choice is now between protecting immigrants who are here already and those who have yet to come. It is an impossible choice. What was once a question of how to best deal with America’s large undocumented immigrant population has now become a debate about the future of all immigrants, regardless of status. America’s identity as a nation of immigrants is under attack. Against this revived nativism, which now sees even lawful family-based immigration as a threat, the United States’ commitment to remaining what John Winthrop, John F. Kennedy and Ronald Reagan called the “city upon a hill” requires fierce defending. This Editorial would be humerous if it were not so hypocritical. For years there has been a drumbeat on the right and the left to overhaul the entire immigration law. Some of the drums were beaten by this Magazine. Now such an overhaul is imminent and the Editors prefer a piecemeal approach. The bench mark for any such an overhaul is and has been the Report of the US Commission on Immigration Reform(Jordan Comission) all the way back into the mid 1990s. Barbra Jordan, a black center left Democrat and a leader of the Civil Rights Movement, headed a bi partisan Commission which produced a document full of analysis and recommendations which were promptly ignored by the Clinton Administration. The Trump proposal respecting reduced and merit based immigration reflects the Jordan Commission recommendations as does his emphasis on strict border control. As a black Civil Rights Leader, Ms Jordan and her Commssion certainly knew and fully understood the diversity argument but after years of study relegated it to a distant fourth or fifth in the goals of immigration reform. Some of The Report's specific concerns were the effect of immigration on the lowest paid citizens, and concluded that not only should immigration be reduced but that it should emphasize potential contribution to the economy. Now comes the Editor who proclaims that diversity is the be all and end all of any immigration overhaul asserting that anything less is "an attack ....on America's identity". If the Editors had taken the time to review the Jordan Report, a result of four years of study, they would have discovered that their current argument is ridiculous..
As an aside the Editors statement that Trump has initiated the phrase "Chain Migration " and that it is a pejorative is nonsense ....the phrase has been in regular use by demographers and politicians since the mid 1960. Until this year no one, including Durbin who has used it, thought this phrase had any negative connotations. 1. Non sequitur? Reducing one form of automatic approval for immigration does not in itself reduce the overall number of immigrants. It does reduce the paths to legal immigration, but not necessarily the numbers. 2. Speculative? Where do we have a national goal of greater diversity? Would such a goal imply we currently lack adequate diversity? By what degree? How would we know when we've achieved a right amount of diversity? Since the immigration reform of the 1960's, there are about 80 million people added to the US population due to immigration. Nearly all are non European. One could argue that the US has pursued a very racist immigration policy. There is lots of evidence that this immigration policy has suppressed wages as large numbers of low skilled immigrants have flooded the work places. Somehow these facts never get discussed as the pro large scale immigration advocates try to shame people by implying they are racist if they disagree with their recommendations. One has to wonder what their objective is. They will never tell you. The Trump administration did not "brand" chain migration. That term has been in use for over two decades. 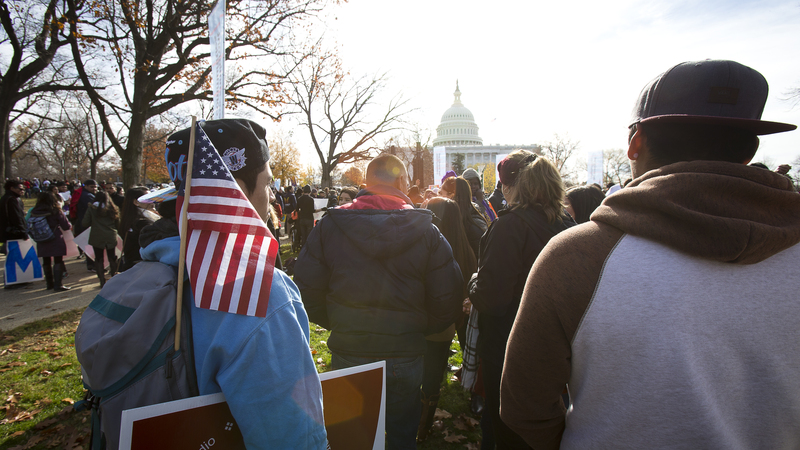 The activist immigration movement will not be satisfied by anything short of total amnesty. That would be a sensible headline. While a strong moral case for accepting the Dreamers as a reality requiring both justice for them, given their unchosen situation and charity/mercy for the future (being allowed to remain, with a path to eventual citizenship), this is a separate matter from the question of qualifying future immigrants and of protecting the borders. As the moral tradition, and Pope Francis, have stated, a nation has a right to an orderly immigration or refugee process. Yes, there should be mercy, but it requires balancing true need with the justice due to those already in a country legally. To reduce this complex moral and political situation in the age of terrorism, as well as international smuggling of drugs and human beings, to "nativist" sentiments is an injustice both to millions so labelled, as well as to the Catholic moral tradition. There has been, and is, intransigence on both sides of the aisle. Now may be the last moment in which the parties can come together, setting aside both utopian ideas of security or of openness and come up with a *reasonable* immigration plan that seeks to both satisfy justice and provide mercy. I don't think this editorial advances that possibility. "By adding legal immigration to his targets, Mr. Trump has revealed a desire to resist a long-term demographic trend toward a greater diversity." What we have now and for too long is not more diversity but more Mexican, how is that being more diverse? This article also appeared in print, under the headline "An Impossible Choice on Immigration," in the February 19, 2018 issue.